At any given time, we know whether or not we are hungry. This is because our brains are constantly integrating signals from organs throughout the body telling it whether or not they need more fuel. Our brains take this information and use it to produce autonomic responses- such as hunger, if they do need more fuel. However, if this system fails, we can develop metabolic diseases including obesity or type 2 diabetes mellitus. Prof. Brüning’s presentation will focus on the neuronal circuits that integrate these signals and the ways they are disrupted in the development of metabolic diseases. 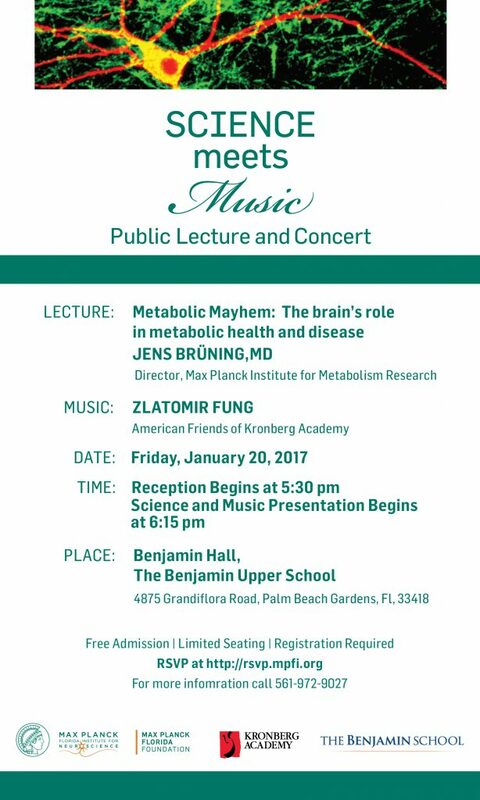 Dr. Brüning joined the Max Planck Institute for Metabolism Research in February 2012 to study how the central nervous system regulates food intake and influences energy availability in the body. Seventeen-year-old cellist Zlatomir Fung won the first prize at the George Enescu International Cello Competition in 2016, first prize at the 2015 Johansen International Competition for Young String Players, and the gold medals at the 2014 Stulberg String Competition and the 29th Irving Klein Competition. He was a top prize winner in the cello division of the 20th International Brahms Competition in Portschach, Austria in 2013, and in the Seventh International Tchaikovsky Competition for Young Musicians in Montreux–Vevey, Switzerland in 2012. Zlatomir has appeared on National Public Radio’s From the Top six times. He has performed as a soloist with the Santa Cruz Symphony, the Boston Pops Orchestra, the Peninsula Symphony, Chamber Players, and was awarded the Landgrave of Hesse Prize at the Kronberg Academy Cello Masterclasses in 2016.